Articulate has released Articulate 360, a brand new subscription-based offering with lots of exciting features, applications and resources. 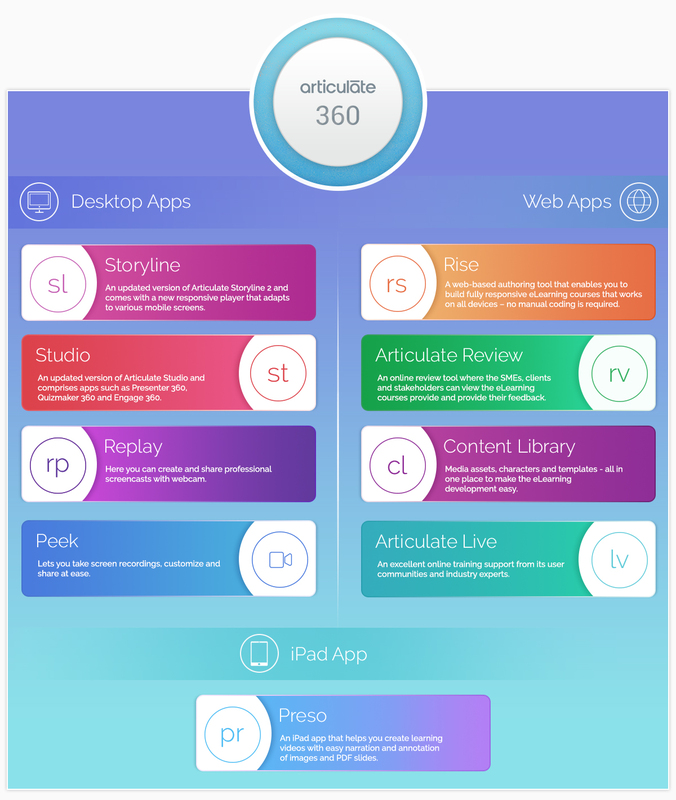 It comes as a complete authoring package with just one annual subscription that lets you access entire Articulate 360. Rise is a web-based authoring tool that enables you to build fully responsive eLearning courses that works on all devices – no manual coding is required. It has been a major focus area of this release. With simple and user-friendly interface, you can take your rapid eLearning as well as custom eLearning development to the next level. This is my favorite area and I was expecting this feature in Articulate 360. Articulate Review is an online review tool where the SMEs, clients and stakeholders can view the eLearning courses provide and provide their feedback. It a great tool to gather consolidated feedback. Articulate Live provides excellent online training support from its user communities and industry experts. Participate weekly webinars to get a better understanding on how to create great eLearning content. Content Library includes media assets, characters and templates that make the eLearning development easy. Articulate Storyline 360 is an updated version of Articulate Storyline 2 and comes with a new responsive player that adapts to various mobile screens. This new responsive player is pretty impressive and supports HTML5 touchscreen gestures to deliver an effective mobile learning course. Moreover, the user interface remains same. It also comes with features like responsive preview toolbar, superior HTML5 output, dial interactions, rename motion paths and much more. Studio 360 is an updated version of Articulate Studio and comprises apps such as Presenter 360, Quizmaker 360 and Engage 360. It lets you create media-rich PowerPoint-based courses responsive to all mobile devices. Replay 360 is where you can create and share professional screencasts with webcam. Peek lets you take screen recordings, customize and share at ease. This means creating application/simulation training is now so easy. Preso is an iPad app that helps you create learning videos with easy narration and annotation of images and PDF slides. Though this is not an extensive product review, I find Articulate 360 as an impressive eLearning authoring tool that can save your time and money in eLearning development. How to Convert Text To Speech Using Articulate Storyline 360? Is Articulate 360 Effective Enough to Create Fully Responsive eLearning Cou... What’s New in Articulate Storyline 360?